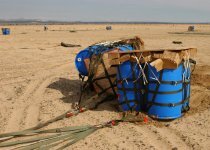 The container delivery system (CDS) is the most commonly used method for the aerial insertion of supplies quickly for military and contingency operations. A-Series Containers and Container Delivery System (CDS) bundles are used as a means of delivering equipment too heavy for the individual jumper to carry. Additionally, they can be utilized to supply the airborne unit or to re-supply units already on the ground. When used properly, A-Series containers and CDS can be a valuable tool for the Airborne Commander. Maximum and minimum weights of the A-Series containers depends on the type of parachute used. The only cargo parachutes authorized for A-Series containers in the 82d Airborne Division, is the: T-10 Modified Cargo Parachute. When using the T-10 Modified Cargo parachute on a C-17, a 20ft static line is used for the cargo parachute. A-Series containers are positioned so the cargo parachute faces inside the aircraft. All dimensions are measured in relation to how the A-Series container stands in the paratroop door. The maximum dimensions of A-Series containers are as follows: 30 inches wide, 66 inches high and 48 inches deep, to include the cargo parachute. The only exceptions to the maximum dimensions are the two and four Stinger Weapons System A-Series containers. 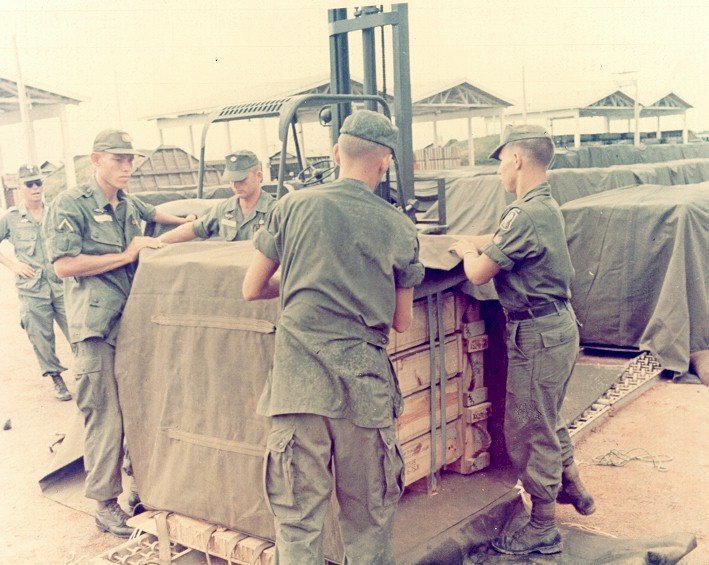 During the Vietnam war, riggers improved upon the innovations developed during the Korean conflict. Developments included the delayed opening of parachutes and the Adverse Weather Aerial Delivery System. This system greatly improved the C-130 aircraft's airdrop capabilities and accuracy in darkness or bad weather. Today, aircrews view poor weather and visibility as aids because poor conditions no longer severely affect accurate delivery of supplies, but provide concealment from small arms fire. After finalizing the developments introduced during the Korean and the Vietnam wars, airdrop technicians left the CDS basically the same throughout Operation Urgent Fury (Grenada, 1982) and Operation Just Cause (Panama, 1989) except for minor modifications to the system. For example, between 1988 and 1989, the skid board dimensions changed to 48 inches by 48 inches in dimension from 53 1/2 inches by 48 inches. Commanders did not capitalize on the potential successes of the CDS during Operation Desert Shield/Storm in Southwest Asia in the early 1990s. Most did not know how to use CDS. As a consequence, commanders did not maximize combat effectiveness and time available, thus risking the safety of the ground forces. This situation is especially tragic because CDS can greatly aid ground forces in feeding, equipping and sustaining themselves. During Provide Promise [3 Jul 92 - 9 Jan 96], a total of 4197 US airland sorties delivered 62,801.5 tons to Sarajevo; deliveries by all nations totaled 160,634 metric tons. Over 2,220 US sorties air-dropped 28,748 CDS (Container Delivery System) bundles and 1,185 TRIADS (tri-wall aerial delivery system) bundles between 28 Feb 93 and 19 Aug 94; 380 German sorties dropped 1,527 CDS and 2,819 TRIADS bundles; 263 French sorties dropped 1,319 CDS and 1,313 TRIADS bundles. The CDS has served the military well in training and military missions in which the primary supplies are Class I (rations), III (petroleum, oils and lubricants), and V (ammunition). It works well because the receiving units can retrograde the airdrop equipment back to the unit holding the hand receipt without loss of the items. Air items are extremely expensive. One CDS bundle costs about $3,000 in expendable and nonexpendable items. In early 2005, back-to-back sorties - eight flown in eight days - cleared the air drop envelope on the stretch C-130J for the container delivery system, or CDS, to carry up to nearly 40,000 pounds of equipment packaged in bundles. The CDS is used in combat to deliver the 'bacon and bullets' to warfighters in the field, and of the 168 bundles released Jan. 24 through 28, none were damaged and testers attained a 100 percent survivability rate. During these sorties, Army testers had a specific objective as to what the damage rate can be expected in order to calculate how much equipment is needed to be dropped so that warfighters on the ground receive the amount needed. The 100-percent survivability rate means the stretch C-130J doesn't have to carry extra equipment and supplies for the Army. Testers rigged together 55-gallon drums of water to create the pallets of either16, 18 or 24 drums weighing 2,300, 2,000 and 1,552 pounds respectively. The pallets - including the rigging and parachutes - were evaluated for structural survivability after the drop. In previous CDS tests four years ago, testers had experienced a CG, or center of gravity, excursion which means the aircraft's center of gravity changes during drops. During the drop, the pilot has to maintain the aircraft's pitch since CDS uses gravity to extract the bundles from the aircraft. It's critical to maintain a tight tolerance so the bundles don't bunch up and damage each other while the extraction occurs. Now, the pilot is aware of CG excursion and can anticipate this movement, he added. The January 2005 bundle drops evaluated pilot technique when overcoming the aircraft's pitch and how much variation can be allowed. Results from this test can be applied to the Air Force Education and Training command because the command will be able to save around $5,000 a bundle drop by reusing the pallets for training purposes. The stretch C-130J is 15 feet longer than the C-130J and, because it's longer, can drop more equipment.